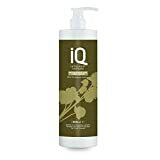 Restore softness, strength, and shine to hair with one of nature’s most effective moisturizers. Ideal for dry hair damaged by heat, chemicals, and environmental elements, Luseta Argan Oil Series helps to undo that damage by reviving each strand to ensure strong, nourished hair. Packed with vitamins, proteins, and antioxidants, argan oil infuses moisture and shine to promote healthier, softer, and more manageable hair while protecting against breakage. The formula is free of sulfates and phosphates making it safe to use on both normal and color-treated hair. Formulated specifically for extremely porous, tight curls and all variations of African-Caribbean hair. Also suitable for chemically processed/relaxed and synthetic hair. Provides a fine balance between thorough yet mild cleansing, leaving hair smooth, glossy, manageable and frizz free. Extensive moisture-binding properties help to repair damaged hair cuticles leaving a brilliant, healthy shine. To use: Apply to wet hair and lather well with a gently kneading of the scalp. Rinse and repeat if necessary. Hair fact: Frequent washing does not strip essential oils from the hair or scalp.